Today's VIS image shows part of Solis Planum. Both volcanic and tectonic forces created the features in this image. 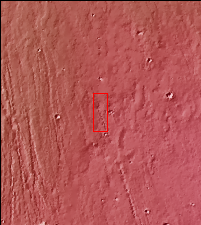 The linear features that run diagonally across the image are fault features called graben. The rough surfaced regions are volcanic flows.